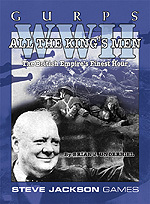 Winston Churchill promised the British forces would "never give up, never surrender." 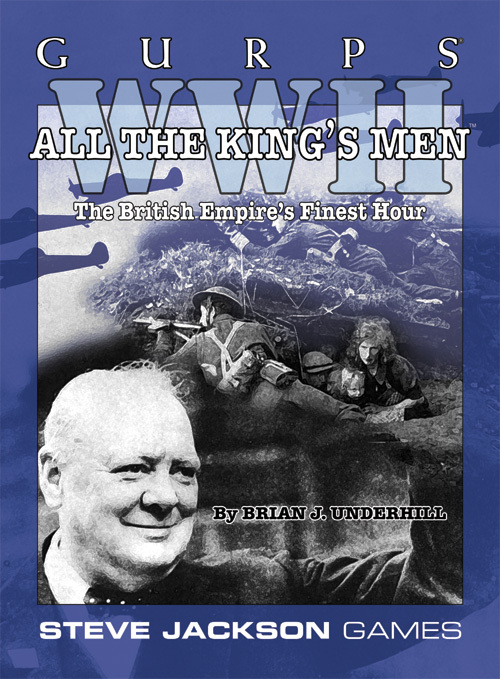 Now you can fight as one of His Majesty's own in GURPS WWII: All the King's Men! Watch as the storm clouds gather over Europe in the late '30s . . . and an unprepared England declares war against Germany in its fighting prime. Experience the fear and heroism of Dunkirk, the sweltering seesaw of Africa, and the final triumphs of the Anglo-American campaigns as a battered British Empire pulls victory from the jaws of darkest defeat! All the King's Men has the same level of background and color found in Iron Cross for German combatants and Dogfaces for American troops. It describes soldiers from all around the British Empire, the way they were recruited, trained, and sent to war, the men who led them, and the battles they won and lost. Also included are a cross-section of British weapons and equipment – from the very good to the very bad, from sidearms to the battleship King George V – and a host of campaign and adventure ideas for GMs. So, keep your chin up and get your lads in the thick of it – sharpish!